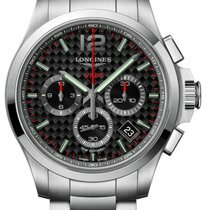 New/unworn Longines Conquest V.H.P. Quartz L37164666. 41mm Stainless steel case. 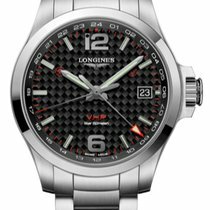 Black carbon dial with luminous silver-tone hands and index hour markers. Arabic numerals mark the 6 and 12 o'clock positions. minute markers around the outer rim. Luminescent hands and markers. Date display at the 3 o'clock position. Fixed stainless steel bezel. Quartz movement. Scratch resistant sapphire crystal. Smart crown. Solid case back. Case thickness: 13 mm. Band width: 20 mm. Stainless steel bracelet with a Deployment clasp. Water resistant at 50 meters / 165 feet.